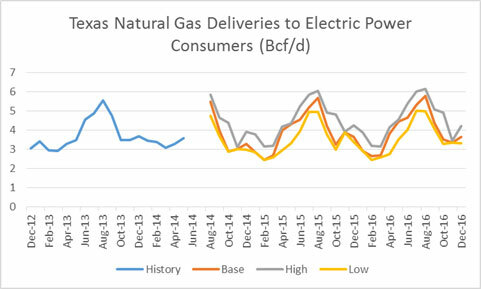 Given the current forward markets and expected shift in generation resources this winter, natural gas demand in the power sector will likely come back down from the highs generated last year given 10 year average winter. However in our high gas demand case where weather is colder than normal and gas-coal spreads move in by 50 cents we can see record winter power gas consumption of 22.5 bcf/d (Dec-Mar) – see figure below. 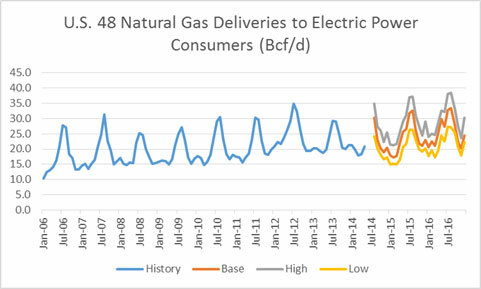 The new revolutionary product by All Energy Consulting’s (AEC), Power Market Analysis (PMA), is also designed to help those better understand the natural gas demand picture (Click for example of Power Trading and Hedging). Natural gas delivered to the ultimate end customer is made out of the following categories: Residential, Commercial, Industrial, Vehicles, and Power. The figure below displays the breakout by category by volume over time. 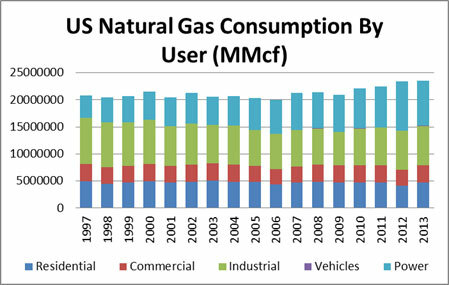 In a short time, gas usage has changed quite drastically with Power now being the largest demand portion for natural gas – see figure below. Unlike residential & commercial markets, the ability to forecast industrial and power gas demands go beyond the simple understanding of weather and the economy. 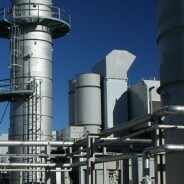 The industrial picture is a data mining process of keeping track of plant closing and starts. The power demand is much more complex as there are significant inter-dependencies in the power market space. Gas demand in power is not just about price if that was the case demand would not have gone up over 4% a year from 2002 to 2008 while gas prices rose 15% a year. The reason for this rise had to do with required balancing of the market and the past market decisions – more discussed in our long-term gas outlook. The power market has a policy fundamental piece which causes certain technology to be retired (e.g. coal) and others to be built (e.g. renewable). 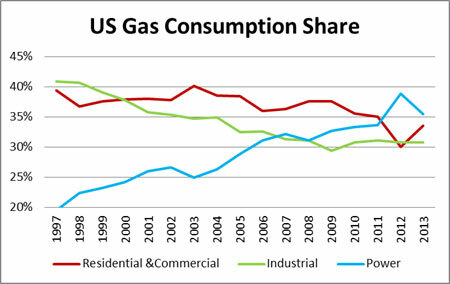 In addition, the competing fuel price can cause significant demand swings (coal-gas switching). PMA is going to take the guess-work out for you in understanding the potential gas demand in the power sector. Our model is based on 20+ years of industry experience and took thousands of man-hours and hundreds of runs to develop and perfect. The underlying dispatch model used in PMA is AuroraXMP by EPIS. We can help those looking to implement AuroraXMP. The following results are historical runs with the actual loads and actual natural gas and coal prices depicted in the model. 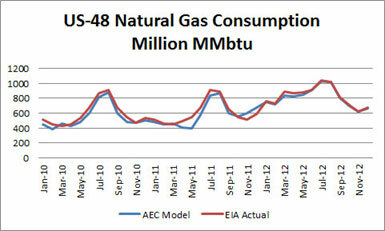 All other nuances, from outage and bidding logic, are the same as presented in the current PMA forecast models. The deviation from 2010-2012 averaged less than 4%. PMA will produce 5 cases of 2 year monthly projections incorporating all the risk in gas demand in the power sector from weather, economy, policy, and inter-fuel dynamics (coal-gas switching). Our model will run daily, incorporating the latest viewpoints from the forward gas and coal markets. The base model will also use AEC’s proprietary load forecasting model to project normal weather conditions. There are two gas sensitivities that will be generated along with the base case – high gas and low gas demand cases. The high gas demand uses historical weather on a monthly basis that drives the highest gas demand, plus it reduces the Henry Hub forwards will by 50 cents per MMbtu. The low case is the inverse of the high case with Henry hub forward adding 50 cents. These three cases will give you a good perspective on the high and low expectations of natural gas demand in the power sector. In addition, these cases can be customized to present even a broader range by incorporating nuclear outages to hydro capabilities. PMA’s output is daily. Online visual displays are available. In addition, the gas consumptions are presented by month by state in an excel file which is in similar design to that published by the EIA. This format can be feed into leading natural gas analytical models such as GCPM by RBAC. Please email me at dkb@allenergyconsulting.com or call me (614-356-0484) if you’re interested in learning more about our new PMA service or would like to discuss a consulting project. Interested parties will receive a free sample output file along with documentation supporting the validation of our modeling efforts.